Whenever someone writes about genetics, they often say the same thing. Our DNA has genes and genes are the instructions for making protein. They'll often add that to use a gene, machinery in the cell must read it. Well, Roger Kornberg won his Nobel Prize for his contributions towards understanding how this machinery works. And this was no easy task! Reading a gene is incredibly complex. First a cell has to decide that a gene will be read and how often to read it. We're not going to talk about this part. Once a cell has "decided" a gene needs to be read, all kinds of proteins load themselves onto the DNA at the start of the gene. Then some of these proteins travel down the DNA and read the gene. We can think about it sort of like a train. Once a cell has decided to read a gene, it builds a train station at the start. Then the train departs the station and heads down the gene. Like a train station, other trains can start from the same station and read the genes as well. Instead of smoke coming out of the smokestack, imagine something called RNA. When a cell reads a gene, it is really making a copy of it in RNA. This is called transcription. The RNA then travels to a ribosome. There, the RNA is translated into protein. Now the protein can go do its job. It can help carry our oxygen, provide support for our cells, digest our food, etc. Or even go back and read a gene! What Roger Kornberg did was greatly expand our knowledge about what part of the train looks like, how it moves along the gene track, and how RNA gets made in the process. He did this using something called X-ray crystallography (this is a big reason why it was a Nobel Prize in chemistry). You might remember that this is the technique that was used to figure out that DNA was a double helix. It is also used to figure out what proteins look like. Using this technique, Roger Kornberg and his group figured out what part of the train, RNA polymerase II (pol II), looks like. And how it pries open the DNA, makes RNA, moves down the DNA, interacts with the other proteins and probably more that I have forgotten to mention! This is impressive for a lot of reasons one of which is that the protein-DNA complex is so huge. As the protein gets bigger, it gets harder and harder to get a good, high resolution picture using X-ray crystallography. Roger Kornberg and his group were able to work this out and get beautiful pictures showing the polymerase in action. There are over 50 different protein units (called subunits) spread out over seven different proteins needed to read a gene. The uninspiring names of these proteins are TFIIB, TFIID, TFIIE, TFIIF, TFIIH , mediator and RNA polymerase II (pol II). Don't blame me, I didn't name them. The TFII part means transcription factor for RNA polymerase II. Remember, transcription is what happens when the gene in the DNA is read into RNA. The letters are just an artifact from the way these proteins were originally discovered years and years ago. Now that we know their names, let's see how all of these proteins work together to read a gene. Imagine a piece of DNA at the start of a gene. Roger Kornberg and his group have done a lot of work on figuring out how the cell decides whether or not this gene will be read. We aren't going to deal with any of this here though. Once the cell has "decided" to read a gene, the next step is to build a train station for the train to leave from. Of course this station isn't made of bricks. Instead it is made of proteins. These proteins have to be put together as carefully as any bricks at a train station. The train station gets built mostly using TFIID. TFIID is a massive protein with at least thirteen different protein subunits. TFIID lands on a spot close to the start of the gene (often at a place called the TATA box). Once there it bends the DNA about 90 degrees and gets the DNA ready for the train. Now this next part is less clear. The train might come in one piece. Or it might be built up at the station, the cars all getting connected there. Scientists are still trying to work this out. Either way, the train ends up sitting between the bent DNAsort of like an animal in DNA jaws. The train is at the main part of the station, waiting for its signal to start. The most important part of the train is pol II. This is the protein responsible for making RNA from the DNA. TFIIB connects TFIID (the station) and pol II (the train). And the other proteins all rest on top of the train and some of them touch the DNA in front of the train, sort of like a cow catcher. Roger Kornberg and his group have helped work out some of the finer details of this complex. For example, some recent work he did showed in detail how TFIIB is a bridge between the TFIID platform and the train, pol II. And how TFIIB works with pol II to keep the DNA track pried open to read. The train at this point isn't actually touching the track. He also worked out when the train touches the track and starts moving. All of this is good solid work. But his major work has been on the moving train. All of the proteins needed to move along a gene form a huge complex. We're only going to deal with the pol II part of the train. But this isn't trivial. Pol II has at least 12 different subunits meaning it takes at least 12 different genes to make it. Getting a good picture of this thing is hard. Getting a snapshot of it on the DNA while making RNA is even harder. But that is what Roger Kornberg and his group did. What I'm going to describe is the train at one moment in time as it is moving along the track. X-ray crystallography gives snapshots not moving pictures (click here for a high resolution image of pol II). The DNA track and the protein train in the station have a certain shape. Once pol II contacts the DNA and starts moving, both the DNA and pol II change shape. The pol II starts out as this blob that is reminiscent of Pac Man. It has this triangular area that closes and clamps down on the DNA when pol II is ready to roll. All of the interesting stuff is happening on the inside of this blob. Let's look at the DNA first. As you know, DNA is a double helix. It is two strands stuck together and wound about themselves in a helix. The information we need is right where the two strands are stuck together. So we need to pry them apart. The train does this as it moves down the track. The DNA is really sort of like a train track. The ties are two bases that sit across from one another. The ties have two halves, each attached to a separate strand. Each tie is called a base pair. 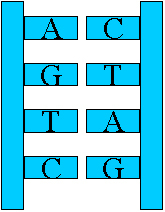 The base pairs line up with each other. An A always goes with a T and a G always goes with a C. Pol II will use this later to make the RNA. So pol II pulls the two halves of the ties apart as it moves. The part of the DNA that is pulled apart is called the transcription bubble. It is around 9 base pairs long. The strand that gets read is bent and lies in a groove inside pol II that fits one strand of the DNA nicely. Above this strand are a funnel and a hole. Pieces of RNA called nucleotides flow through the funnel and out of the hole. If the nucleotide matches the base, then it is attached to the growing RNA by pol II. For example, if the DNA base is a G, then a C nucleotide can attach. As long as it is an RNA. Once a nucleotide is attached to the growing RNA, the train moves one tie down. Behind the train, two ties come back together so that the double helix of the DNA starts to zip back up. One base of the RNA also becomes unattached. And one tie opens up in front of the train. So here's what's going on. The train goes down the track, lifting part of it up. The train then inserts the part of the track that is lifted up into a car of the train, separating the two sides of the track in the process. As the train continues to move, the separated track is put back together and reattached to the ground. Meanwhile, more track is taken up and separated. The RNA streams out of one part of the train, dragging behind, free from the DNA. This continues until the train reaches a part of the track that isn't taken up anymore. The train stops making RNA and eventually flies off the track looking for another station. Of course I have grossly simplified this whole thing. What Roger Kornberg and his group did was to develop a picture of this process in incredibly fine detail. He was able to show which parts of pol II interact with which part of the DNA, RNA, and other proteins. By part, I mean which amino acid. Pol II is made up of thousands of these amino acids put together in a certain way. This long chain of amino acids then folds on itself in a certain way to create pol II. Roger Kornberg and his group were able to tell us exactly which amino acids contacted which bases of DNA and RNA. And which amino acids are responsible for making the DNA bend in the polymerase. He also showed us how big the transcription bubble is, what is going on in the bubble, where the DNA is, how the DNA opens and zippers back shut, how parts of pol II move when they are on the DNA versus when they are floating free, etc. From this, we can determine how it all works. And propose new experiments that can test the finer details of this model. As someone who used to work of transcription, let me tell you it is something to see this level of detail. This is so cool.